I guess my Auburn hate continues... Sorry, but that's the story of the past and present weeks. I had a quick thought hit me on the ride back from Oxford. Where's the support for Chizik? (Other than his wife's Facebook page.) 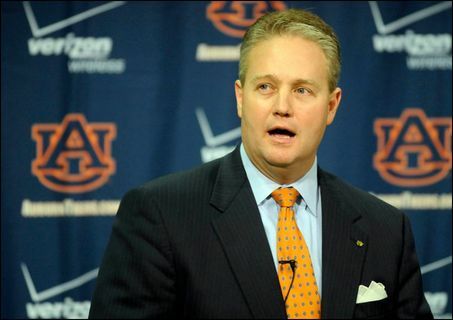 The Auburn administration has been awfully quiet this past month. The longer that there is no positive statement by Auburn officials that Gene Chizik is their football coach for 2013 (I have yet to be able to find one - positive or not), the WORSE it gets for Gene. Here's why: There's not one winnable game remaining on the schedule remaining that is significant enough to change the doubters' minds. Just look at it. They'll beat Alabama A&M and New Mexico State, but the rest of that slate? Beating Vandy? That doesn't save jobs. Beating Alabama and/or Georgia? That might, but it ain't going to happen. The longer the losing goes on this year with no statement or backing (besides the BS stuff you are hearing from Pat Dye on Finebaum's show) from Auburn brass, the public pressure will continue to mount on that group to make a move, because there's nothing on the horizon that can be done on the field to relieve that pressure. Jay Jacobs - nothing to say here. Jay Jacobs? Dr. Gogue? Anything to say? Where are you guys? Rightfully or not, Chizik's being left out to dry right now.